During the night of the 11th of September a tragic accident occurred on Main-Donau-Kanal in Erlangen, Germany. 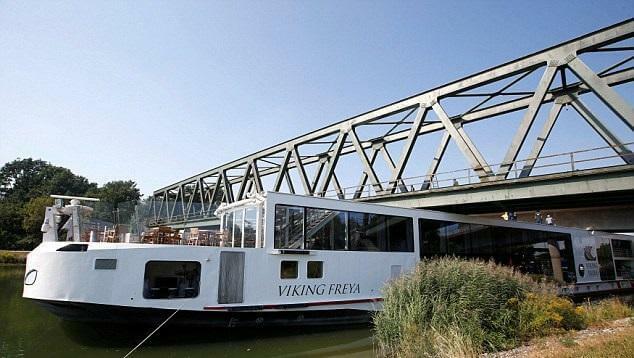 Two Hungarian crew members (aged 33 and 49) died while navigating the Swiss flagged Viking River Cruises cruise ship Viking Freya when the wheelhouse was impacted by a rail bridge because it had not been retracted. All 180 passengers were successfully evacuated. Low bridges have always posed risks directly affecting the tasks and workload of the nautical crew in inland navigation. As the river cruises business grows and grows, the nautical crew is more and more under pressure 24 hours a day to comply with tight time schedules. A recent German study on psychological stress factors in inland waterways highlighted the hazards and stress involved in passing low bridges. Statistics show an average of 16 bridge collisions a year in the western part of the German canal network alone. Unfortunately that same day a similar accident occurred on the Danube. The new Swiss river cruise vessel «Anesha» from Phoenix Tours (owned in fact by the company SCYLLA) transporting 200 people stranded on the banks near Vojka, Slovakia. After a check to ensure there was no hull damage the voyage was continued. Safety of inland navigation should be a priority for all stakeholders: these events, which occur more frequently when the season comes to an end, sadly demonstrate that fatigue of nautical crew has direct consequences on safety. oFrom Dailymail website (in English).